I just want you to win the fight with Sims on Twitter. When will Swamp Thing meet Aaron Lopresti’s Garbage Man? I’m guessing Ms. Kempo is an insanely fun woman to be around. Good on you, Employee Aaron! 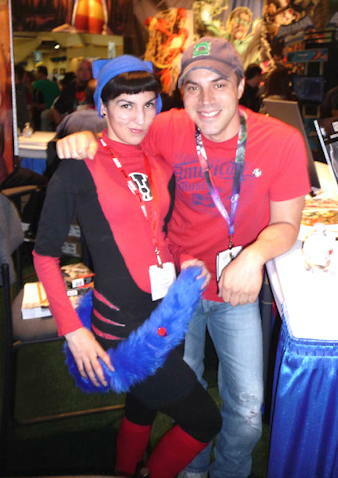 Actually , i asked Geoff Johns if I can look forward to seeing a Battle between Dex-star and STREAKY THE SUPER CAT :D he replayed “Absolutely” . Funny thing,Next day I bumped into him in my Streaky the super cat costume while running threw a crowd with my arms out saying WWWWOOOOSssshhh! Love it! Dex Starr has become a guilty pleasure for me. I won’t be truly happy until I see him fight Rocket Racoon.